This time PK Helper want some tips to maintain healthy eye when using a computer late at midnight. Usually this happens on Internet marketers and bloggers where they are more active at night like bats.Obviously the above activities are not good for health, especially for eye health. When we use computers that use LED screen, the screen will emit white light and blue light blue which is not too good for the eyes. It is the Deficiency of the hormone melatonin resulting you to forget sleep at night.Followed by Stress on the retina of the eye.Many researchers says that the blue light from the LED can damage the eyes, especially in the use of night that where the exact needs and differences in light with light on a computer screen with different light around. The good news for Internet marketers and bloggers that there is software that can adjust the blue LED light on the computer screen, the software named F.lux. 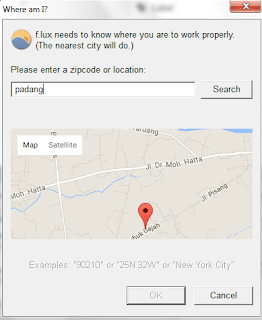 So the workings of the software will adjust the light on the screen with the benchmark time on our computer.When was the night this software will reduce the blue light from the screen that caused the screen slightly reddish and yellowish.To use this software you can download directly on their official website for free at https://justgetflux.com.Once downloaded, directly install on your computer.The first action once installed you have to set in advance the location where you are because in the app the default location is New York in the United States. 1.Open the application then click settings. 2.Then click on the button change as shown below. 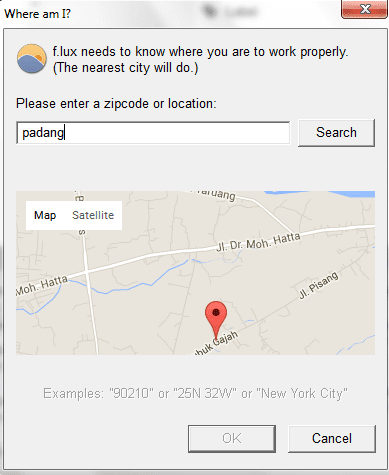 3.Then enter the city name in the field provided as "Padang". This must be done if you really do not want to wear glasses. This means that alternating close look at the screen and occasionally see distant objects with the range of 20 minutes looking at the screen. 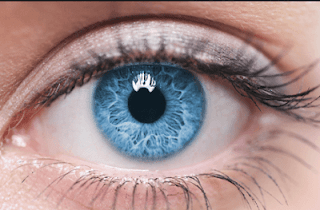 Causes we nearsightedness is too long to see objects up close, the eye muscles become stiff because there is no movement. Therefore after seeing the screen at 20 minutes bisakan see distant objects for 1 minute so that the eye muscles to work and elastic. 3. Drink More Water H2O. Do not get used to drink coffee while staying up late at the computer, but change into the white water. White water not only maintain eye health, but also the health of the body.I was alone at the time of staying up spending 3 bottles of water or 3 liters, so that the body remain fit and not sick. Maintaining eye health is mandatory, especially for users such excessive computer programmers and others. Hopefully the above manner can reduce eye damage in the eyes of all of us. Thanks for the awesome post, I heard there is a screen cover that you can also get the helps the eyes. This is a major problem for all those who earn a living online. I developing square eyes at the moment and I don't know what to do. Will try the app you mentioned thou. Thanks a bunch man!